Happy New Year, readers! There’s nothing like being home after travel, is there? I took my time at the Farmer’s Market on Saturday, it was slow and smaller than usual thanks to the holidays, but it’s the season for some of my favorite vegetables. Broccoli and Cauliflower! Mustard greens, some beautiful lettuce, and sweet potatoes rounded out my purchases for the week. Put the chicken chunks into a bowl, pour in the marinade, and stir to coat. Prepare your vegetable selections, making sure everything is cut into uniform sizes. Vegetables that take longer to cook (corn, water chestnuts, carrots) should be cut smaller than faster cooking vegetables. In a wok (I used a cheap wok from IKEA for 10 years, and recently replaced it with this one since I stir fry a lot it’s worth the investment to me) heat 2 tablespoons of olive oil to shimmering hot. HOT is the key to stir fry (but don’t light your kitchen on fire, keep both eyes on it!). Drop the chicken and marinade into the wok and cook, stirring constantly, until the chicken is browned on the outside. Add your vegetables and continue cooking until the chicken is cooked through and the vegetables are tender, but still brightly colored. Watch your heat, you want it to be hot, but not burn. If you like to have a little sauce, toward the end of cooking pour a few tablespoons of water into the pan, dribbling it along the side of the wok so it heats up before it hits the rest of the ingredients. Serve over the rice variety of your choice (my fave is Basmati, but any variety will do). My plan for Sunday was to rest in preparation for a big New Year’s Eve dinner, so my husband threw together some pasta and crusty bread. Quick, simple, and I didn’t have to make it! Monday I baked a spiral ham with sweet potatoes, spaetzle, and biscuits. I love making biscuits from scratch when I have a chance (isn’t it a requirement for Southern residency?). I start with Betty Crocker’s Baking Powder Biscuit recipe, which I found in my oldest, most beaten up cookbook, but is now online thanks to the magic of the internet. I replace the shortening with butter and the milk with buttermilk. Tuesday we had leftover ham, much to my children’s delight. My son opted for rolled up deli turkey. Insert eye roll. I got experimental on Wednesday, making a dish that was both new to us and vegetarian. I made a resolution to start incorporating more meatless meals into our dinner menu, to both save money and reduce our environmental impact. So I made quinoa and black bean tacos from my new vegetarian cookbook “Love Real Food.” I was pleasantly surprised, they were quite good. I’ll tweak the spices next time because the flavor wasn’t as in your face as we like, probably with more garlic (have you noticed yet how much I like garlic? Because I really like garlic. Fortunately, there is lots of garlic to be found at the Market), more chili powder, and possibly the addition of a homemade taco sauce because we were missing some moisture. But overall the tacos were really good, I think we’ll make them a regular addition. 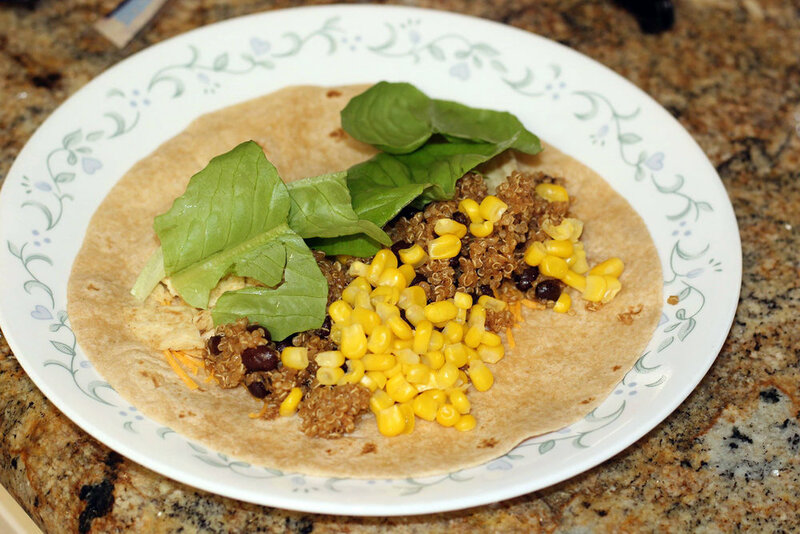 I topped mine with lettuce from the Market, cheddar cheese, corn, and some crumbled tortilla chips for crunch. If you’re wondering how they went over with the kids, well… it’s good to keep chicken nuggets in the freezer. I threw together a quick chicken chili on Thursday with boxed cornbread. Today we’ll clean out all of the leftovers from this week; there are lots of options. I’m sure my kids will complain about all of them and ask for McDonald’s, but I’m not going to give in because we made it through a week without takeout! Another resolution for the new year is to eat out less, I’m going to call this week a success and enjoy this sense of pride before life happens and we get derailed.